War Baby is a dramatisation of the Baby's Diary belonging to actress, Carol Cleveland. It has been presented as a stage production at various Arts Festivals and is now adapted for radio. The Dairy was written by Carol's parents during the London Blitz and given to her on her eighteenth birthday. Her mother and father were divided in their opinions of the war effort...one forever optimistic, while the other's strong moral convictions threatened to tear the family apart. The common denominator was their great love for the daughter that friends said they were 'cruel' to have. 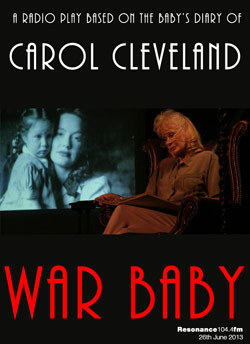 War Baby is an authentic document of its kind, written by one exceptional family who lived through the hardships of war. It's a story of love and loss, of war and peace, of hope and despair, with a big chunk of 'show-business' thrown in too! "An informative, engaging and extremely moving account of a family at war."